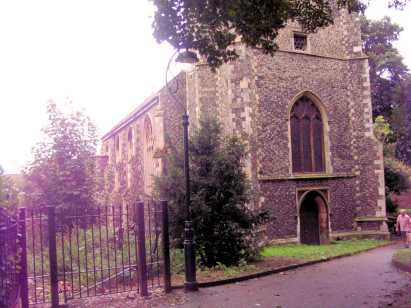 The parish of St Peter Parmentergate lies in southeastern Norwich, one of many parishes clustered along King Street. King Street was formerly the main entrance road from the south to the city, nowadays a narrow lane, and lies along the route of the main Roman road crossing the ancient city. The parish was an important and populous parish, abutting the ancient market and bailey of the castle. At the time of this transcript it was an area moving down the social scale as the wealthy of the city increasingly moved outside the city walls. Once frequented by artisans and it became area dominated by industries, notably the nearby railway, brewing (there were 3 breweries along King Street at one time and the growing mustard business of Colmans. St Peter lies adjacent to King Street in a tightly enclosed graveyard - it is close to the junction of King Street and Mountergate hence the distinction from the other St Peters in the city. The church is largely a 15th & 16th century build so quite late for a Norfolk church. There are few notable architectural features to warrant praise from Pevsner. Nowadays the church has been deemed surplus to requirements for worship and is managed by the Churches Trust. It is used as artists studios and as rentable space for public use. Two standard register books cover the period of this transcript; the first is a standard 1600-entry ledger, the second a 2400-entry. The second register continues beyond the end of the project date until 1883. The two registers are filmed on both microfiche and microfilm - the fiche were of sufficiently poor quality to restrict the use to the film - Microfilm MFRO/154 in the collection of the Norfolk Record Office. Both fiche and film are rather elderly and lack the quality of modern reproductions. Indeed the quality at times was exceptionally poor with entries faded to almost invisibility. There was much reference both to concurrent Bishop's Transcripts and also to images held on Familysearch which benefited from use of photo manipulation to make a readable view. As a consequence on this occasion there can be no confidence that 100% accuracy has been achieved and this transcript carries a health warning accordingly.